Kofi Kingston had done it! 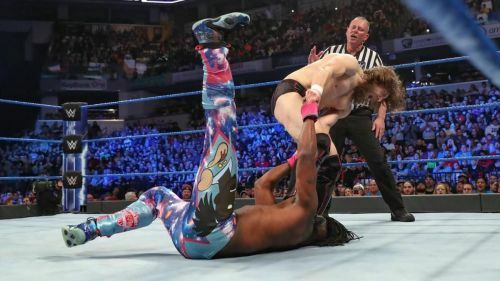 The New Day member took on not 1, not 2, not 3, not 4 but 5 of WWE's top stars and beat them all on the very same night. He did it without any assistance or interference. He won the match as clean as a whistle. And then Vince McMahon's music hit, seemingly to congratulate Kofi Kingston for making it to WrestleMania 35, to contest against The New Daniel Bryan for the WWE Championship. Much to the dismay of those in attendance, McMahon made an addition. Daniel Bryan would be the sixth man that Kofi Kingston would have to face that very night. A lot of our readers have been asking why Daniel Bryan was added to the match. And I think I may just have the answer for you folks. Because of how passionate all of us are as sports entertainment fans, it is sometimes easy to forget that both brands of WWE are weekly television shows. What this basically means is that while the payoff to a big angle could happen every week, sometimes it's necessary to stretch it to the next, to ensure that the audience comes in for the ride. If you give everything away at one go, there may not be any excitement for next week's show. So, obviously, Kofi Kingston is going to WrestleMania. Anyone who's even remotely familiar with WWE knows that this is going to be the big payoff. And he's not just going to the show, but he's going to be competing for the WWE Championship. In all likelihood, he's even going to win the big match. So Daniel Bryan's inclusion was merely a red herring.